CBA top team - Flying Leopards (27-4) had no problems winning another game on Tuesday. This time they crushed fifteenth ranked Eagles (10-21) in Yingkou 140-113. It ended at the same time the two-game winning streak of Eagles. Flying Leopards dominated down low during the game scoring 86 of its points in the paint compared to Eagles' 58. They outrebounded Eagles 43-30 including a 35-23 advantage in defensive rebounds. Flying Leopards shot the lights out from three sinking 13 long-distance shots on high 56.5 percentage. They looked well-organized offensively handing out 24 assists comparing to just 9 passes made by Eagles' players. The former international Ailun Guo (192-93) orchestrated the victory with a double-double by scoring 27 points, 6 rebounds, 10 assists and 4 steals. American forward Brandon Bass (203-85, college: LSU) contributed with 32 points and 8 rebounds (was perfect 10-for-10 from the free throw line !!!) for the winners. American point guard Jonathan Gibson (188-87, college: N.Mexico St.) replied with 52 points (!!!) and 5 assists for Eagles. The winner was already known earlier in the game, so both coaches allowed to play the bench players saving starting five for next games. Flying Leopards have an impressive 16-game winning streak. Defending champion maintains first position with 27-4 record, which they share with Guangdong ST. Eagles at the other side keep the fifteenth place with 21 games lost. Flying Leopards is looking forward to face Jilin Tigers (#11) in Changchun in the next round and are hoping to win another game. Eagles will play on the road against Golden Bulls (#12) in Hangzhou and are hoping to prove to their fans that the loss was just an accident. Ninth-ranked Sharks (16-15) used its home court advantage to challenge fifth ranked Beijing Ducks (21-10) in Shanghai. The visitors from Beijing managed to secure only two-point victory 120-118. However their fans expected much easier game. Worth to mention a great performance of Croatian-American center Justin Hamilton (213-90, college: LSU) who helped to win the game recording 28 points, 7 rebounds and 8 assists and Aaron Jackson who added 24 points, 6 rebounds, 11 assists and 4 steals during the contest. American point guard Jimmer Fredette (188-89, college: BYU) responded with 44 points (!!! ), 8 rebounds and 8 assists. Both coaches used bench players in such tough game. Beijing Ducks have a solid three-game winning streak. They maintain fifth position with 21-10 record. Sharks lost seventh consecutive game. They keep the ninth place with 15 games lost. Beijing Ducks will play against higher ranked Zhejiang Guangsha Lions (#4) in Hangzhou in the next round and it may be quite challenging game. Sharks will play on the road against Gold Lions (#17) in Tianjin and hope to get back on the winning track. Worth to mention about the upset in a game between Xinjiang Flying Tige (20-10) and Golden Stars (15-16), which took place in Urumqi. Higher ranked Xinjiang Flying Tige lost at home to tenth ranked Golden Stars 109-126 on Tuesday. The winners were led by Donatas Motiejunas who had that evening a double-double by scoring 40 points (!!! ), 15 rebounds and 5 assists. Even a double-double of 38 points (!!! ), 9 rebounds and 13 assists (was perfect 11-for-11 from the free throw line !!!) 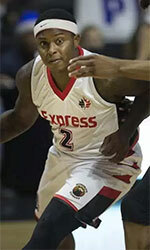 by Darius Adams did not help to save the game for Xinjiang Flying Tige. Both coaches tested many bench players which allowed the starters a little rest for the next games. Golden Stars have a solid three-game winning streak. They maintain tenth position with 15-16 record. Loser Xinjiang Flying Tige dropped to the sixth place with ten games lost. Golden Stars will meet Jiangsu Dragons (#13) in the next round. Xinjiang Flying Tige will play against Blue Whales (#18) in Sichuan and hope to secure a win. The game between 19th ranked Fly Dragons (7-24) and seventh ranked Long-Lions (18-13) in Beijing ended with biggest points difference. Guests from Guangzhou outscored Fly Dragons 133-92. The best player for the winners was Kyle Fogg who had a triple-double by scoring 36 points (!!! ), 10 rebounds and 12 assists. Since the result was very predictable, it gave the chance for the coaches to test many bench players and allowed the starting five to rest. Long-Lions maintains seventh position with 18-13 record. Fly Dragons lost seventh consecutive game. They keep the nineteenth place with 24 games lost. Long-Lions' next round opponent will be league's second-placed Guandong Tigers in Dongguan and they do not belong to the favorites in that game. Fly Dragons will play on the road against Bayi Rockets (#20) in Ningbo and it may be a tough game between close rivals. There were no big surprises in other games of round 32: Sichuan BW were beaten by Jilin NE T. on the road 105-94. Tianjin GL was destroyed by Jiangsu D. on its own court 106-128. Bottom-ranked Bayi R. was outscored by Guangsha L. in Hangzhou 119-87. Guangdong ST rolled over Fujian S. at home 139-100. Shenzhen L. crushed Nanjing TX MK on the opponent's court 110-91. Shanxi Z. was smashed by Zhejiang Ch. in a home game 91-113. No shocking result in a game when eleventh ranked Jilin Tigers (14-16) beat 18th ranked Blue Whales (7-23) in Changchun 105-94. Jilin Tigers made 21-of-25 charity shots (84.0 percent) during the game. The best player for the winners was American guard Dominique Jones (193-88, college: S.Florida) who had a double-double by scoring 37 points (!!! ), 9 rebounds and 11 assists. Polish-Swedish power forward Maciej Lampe (211-85) chipped in a double-double by scoring 17 points and 20 rebounds. American power forward Jason Thompson (211-86, college: Rider) produced a double-double by scoring 25 points, 21 rebounds and 8 assists and his fellow American import Jamaal Franklin (196-91, college: San Diego St., agency: Slash Sports) added 26 points, 12 rebounds and 9 assists respectively for the guests. Four Jilin Tigers and five Blue Whales players scored in double figures. Both coaches allowed to play bench players saving starting five for next games. Jilin Tigers maintains eleventh position with 14-16 record. Blue Whales lost seventh consecutive game. They keep the eighteenth place with 23 games lost. Jilin Tigers' next round opponent will be league's leader Flying Leopards in Yingkou and they do not belong to the favorites in that game. Blue Whales will play at home against Xinjiang Flying Tige (#6) and hope to win that game. Very expected game when 17th ranked Gold Lions (8-23) were smashed by thirteenth ranked Jiangsu Dragons (14-17) in Tianjin 128-106. Jiangsu Dragons dominated down low during the game scoring 78 of its points in the paint compared to Gold Lions' 34. Their players were unselfish on offense dishing 26 assists. 27 personal fouls committed by Gold Lions helped opponents get some easy free throw opportunities. The best player for the winners was American guard Donald Sloan (190-88, college: Texas A&M) who scored 32 points and 6 assists. Serbian center Miroslav Raduljica (213-88) chipped in a double-double by scoring 23 points and 13 rebounds. Five Jiangsu Dragons players scored in double figures. American-Montenegrin point guard Taylor Rochestie (185-85, college: Washington St.) produced a double-double by scoring 38 points (!!!) and 10 assists and guard DeShuai Shi (192-92) added 22 points and 10 rebounds respectively for the hosts. Since the result was very predictable, it gave the chance for the coaches to test many bench players and allowed the starting five to rest. Jiangsu Dragons moved-up to twelfth place, which they share with Zhejiang Ch. Gold Lions at the other side keep the seventeenth position with 23 games lost. Jiangsu Dragons' next round opponent will be higher ranked Golden Stars (#10) in Jinan and it may be quite challenging game. Gold Lions will play at home against Sharks (#9) and hope to win that game. Worth to mention about the upset in a game between Xinjiang Flying Tige (20-10) and Golden Stars (15-16), which took place in Urumqi. Higher ranked Xinjiang Flying Tige lost at home to tenth ranked Golden Stars 109-126 on Tuesday. Golden Stars looked well-organized offensively handing out 35 assists. The winners were led by Lithuanian power forward Donatas Motiejunas (213-90) who had that evening a double-double by scoring 40 points (!!! ), 15 rebounds and 5 assists and American point guard Ty Lawson (180-87, college: N.Carolina) supported him with 27 points and 13 assists. Even a double-double of 38 points (!!! ), 9 rebounds and 13 assists (was perfect 11-for-11 from the free throw line !!!) by American-Bulgarian point guard Darius Adams (188-89, college: Indianapolis) did not help to save the game for Xinjiang Flying Tige. International Abudushalamu Abudurexiti (203-96) added 22 points and 6 rebounds for the hosts. Both teams had four players each who scored in double figures. Both coaches tested many bench players which allowed the starters a little rest for the next games. Golden Stars have a solid three-game winning streak. They maintain tenth position with 15-16 record. Loser Xinjiang Flying Tige dropped to the sixth place with ten games lost. Golden Stars will meet Jiangsu Dragons (#13) in the next round. Xinjiang Flying Tige will play against Blue Whales (#18) in Sichuan and hope to secure a win. Ninth-ranked Sharks (16-15) used its home court advantage to challenge fifth ranked Beijing Ducks (21-10) in Shanghai. The visitors from Beijing managed to secure only two-point victory 120-118. However their fans expected much easier game. Beijing Ducks players were unselfish on offense dishing 35 assists. Worth to mention a great performance of Croatian-American center Justin Hamilton (213-90, college: LSU) who helped to win the game recording 28 points, 7 rebounds and 8 assists and American guard Aaron Jackson (190-86, college: Duquesne) who added 24 points, 6 rebounds, 11 assists and 4 steals during the contest. American point guard Jimmer Fredette (188-89, college: BYU) responded with 44 points (!!! ), 8 rebounds and 8 assists and Argentinian-Spanish power forward Luis Scola (206-80) scored 20 points and 5 rebounds (on 8-of-10 shooting from the field). Four Beijing Ducks and five Sharks players scored in double figures. Both coaches used bench players in such tough game. Beijing Ducks have a solid three-game winning streak. They maintain fifth position with 21-10 record. Sharks lost seventh consecutive game. They keep the ninth place with 15 games lost. Beijing Ducks will play against higher ranked Zhejiang Guangsha Lions (#4) in Hangzhou in the next round and it may be quite challenging game. Sharks will play on the road against Gold Lions (#17) in Tianjin and hope to get back on the winning track. Very predictable result when fourth ranked Zhejiang Guangsha Lions (23-7) rolled over bottom-ranked Bayi Rockets (6-25) in Hangzhou 119-87. Zhejiang Guangsha Lions dominated down low during the game scoring 74 of its points in the paint compared to Bayi Rockets' 48 and made 21-of-26 charity shots (80.8 percent) during the game. Zhejiang Guangsha Lions forced 19 Bayi Rockets turnovers. Their players were unselfish on offense dishing 27 assists. 25 personal fouls committed by Bayi Rockets helped opponents get some easy free throw opportunities. The best player for the winners was international center Jinqiu Hu (208-97) who had a double-double by scoring 26 points and 13 rebounds (on 11-of-12 shooting from the field). Greek center Ioannis Bourousis (214-83) chipped in a double-double by scoring 10 points, 11 rebounds and 4 assists. The former international center Hao Fu (206-97) produced 14 points and 5 rebounds and the former international guard Shuo Han (196-86) added 8 points, 7 rebounds and 5 assists respectively for the guests. Both teams had four players each who scored in double figures. Since the result was very predictable, it gave the chance for the coaches to test many bench players and allowed the starting five to rest. Zhejiang Guangsha Lions have an impressive five-game winning streak. They maintain fourth position with 23-7 record. Bayi Rockets lost fourth consecutive game. They stay dead last with 25 lost games. Zhejiang Guangsha Lions' next round opponent will be Beijing Ducks (#5) on the road. Bayi Rockets will play against Fly Dragons (#19) and it may be a tough game between close rivals. Not a big story in a game when 7th ranked Sturgeons (17-14) were outscored by second ranked Guandong Tigers (27-4) in Dongguan 139-100. Guandong Tigers dominated down low during the game scoring 82 of its points in the paint compared to Sturgeons' 52. Their players were unselfish on offense dishing 27 assists. The best player for the winners was American guard Malcolm Delaney (191-89, college: Virginia Tech) who scored 29 points, 7 rebounds and 7 assists. The other American import swingman Sonny Weems (198-86, college: Arkansas) chipped in 24 points, 7 rebounds and 7 assists. International Zhelin Wang (214-94) produced a double-double by scoring 20 points and 11 rebounds and Canadian Andrew Nicholson (206-89, college: St.Bonaventure) added 21 points and 7 rebounds respectively for the guests. Both teams had five players each who scored in double figures. Since the result was very predictable, it gave the chance for the coaches to test many bench players and allowed the starting five to rest. Guandong Tigers have a solid four-game winning streak. They keep a position of league leader, which they share with Liaoning FL. Sturgeons lost third consecutive game. They dropped to the eighth place with 14 games lost. Guandong Tigers' next round opponent will be Long-Lions (#7) in Guangzhou where they are favorite. Sturgeons will play at home against Leopards and hope to win that game. CBA top team - Flying Leopards (27-4) had no problems winning another game on Tuesday. This time they crushed fifteenth ranked Eagles (10-21) in Yingkou 140-113. It ended at the same time the two-game winning streak of Eagles. Flying Leopards dominated down low during the game scoring 86 of its points in the paint compared to Eagles' 58. They outrebounded Eagles 43-30 including a 35-23 advantage in defensive rebounds. Flying Leopards shot the lights out from three sinking 13 long-distance shots on high 56.5 percentage. They looked well-organized offensively handing out 24 assists comparing to just 9 passes made by Eagles' players. The former international Ailun Guo (192-93) orchestrated the victory with a double-double by scoring 27 points, 6 rebounds, 10 assists and 4 steals. American forward Brandon Bass (203-85, college: LSU) contributed with 32 points and 8 rebounds (was perfect 10-for-10 from the free throw line !!!) for the winners. American point guard Jonathan Gibson (188-87, college: N.Mexico St.) replied with 52 points (!!!) and 5 assists and the former international swingman ChengYu Zhang (193-89) added 13 points and 5 rebounds in the effort for Eagles. Four Flying Leopards and five Eagles players scored in double figures. The winner was already known earlier in the game, so both coaches allowed to play the bench players saving starting five for next games. Flying Leopards have an impressive 16-game winning streak. Defending champion maintains first position with 27-4 record, which they share with Guangdong ST. Eagles at the other side keep the fifteenth place with 21 games lost. Flying Leopards is looking forward to face Jilin Tigers (#11) in Changchun in the next round and are hoping to win another game. Eagles will play on the road against Golden Bulls (#12) in Hangzhou and are hoping to prove to their fans that the loss was just an accident. Everything went according to plan when third ranked Leopards (24-7) outplayed 16th ranked Monkey Kings (9-22) in Jiangsu 110-91. Leopards players were unselfish on offense dishing 24 assists comparing to just 10 passes made by Monkey Kings' players. 24 personal fouls committed by Monkey Kings helped opponents get some easy free throw opportunities. The best player for the winners was swingman Xining He (193-97) who scored 24 points and 7 rebounds. 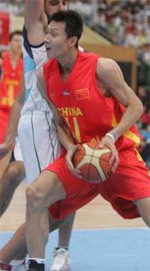 The former international forward QuAn Gu (202-92) chipped in 18 points and 8 rebounds. Five Leopards players scored in double figures. Leopards' coach Jianjun Wang allowed to play the deep bench players saving starting five for next games. American guard Joseph Young (188-92, college: Oregon) produced 43 points (!!!) and 9 rebounds and forward JianYe Song (198-91) added 14 points, 7 rebounds and 5 assists respectively for the hosts. Leopards maintains third position with 24-7 record having just three points less than leader Liaoning FL. Monkey Kings lost fifth consecutive game. They keep the sixteenth place with 22 games lost. Leopards' next round opponent will be Sturgeons (#8) in Jinjiang where they are favorite. Monkey Kings will play on the road against Brave Dragons (#14) in Taiyuan and it may be a tough game between close rivals. There was no surprise when 14th ranked Brave Dragons (11-20) were outleveled by twelfth ranked Golden Bulls (14-17) in Taiyuan 113-91. Golden Bulls made 23-of-30 charity shots (76.7 percent) during the game. Their players were unselfish on offense dishing 24 assists. American players dominated the game. The best player for the winners was guard Brandon Paul (193-91, college: Illinois, agency: Pensack Sports) who scored 35 points (!!! ), 8 rebounds, 4 assists and 4 steals. Guard Marcus Denmon (191-90, college: Missouri, agency: BeoBasket) chipped in 23 points, 5 rebounds and 7 assists. Four Golden Bulls players scored in double figures. Shabazz Muhammad (198-92, college: UCLA) produced a double-double by scoring 32 points, 12 rebounds and 5 assists and point guard Bobby Brown (188-84, college: CS Fullerton) added 13 points and 7 assists respectively for the hosts. Since the result was very predictable, it gave the chance for the coaches to test many bench players and allowed the starting five to rest. Golden Bulls maintains twelfth position with 14-17 record, which they share with Jiangsu D. Brave Dragons at the other side keep the fourteenth place with 20 games lost. Golden Bulls' next round opponent will be Eagles (#15) in Qingdao. Brave Dragons will play at home against Monkey Kings and it may be a tough game between close rivals. The game between 19th ranked Fly Dragons (7-24) and seventh ranked Long-Lions (18-13) in Beijing ended with biggest points difference. Guests from Guangzhou outscored Fly Dragons 133-92. Long-Lions made 19-of-20 charity shots (95.0 percent) during the game. Long-Lions outrebounded Fly Dragons 48-27 including a 38-22 advantage in defensive rebounds. Their players were unselfish on offense dishing 34 assists comparing to just 19 passes made by Fly Dragons' players. The best player for the winners was American point guard Kyle Fogg (190-90, college: Arizona) who had a triple-double by scoring 36 points (!!! ), 10 rebounds and 12 assists (was perfect 11-for-11 from the free throw line !!!). Forward Yongpeng Zhang (208-90) chipped in 15 points and 8 rebounds (on 7-of-9 shooting from the field). American Thomas Robinson (208-91, college: Kansas) produced a double-double by scoring 27 points, 11 rebounds and 5 assists and Mengjun Xu added 17 points and 6 rebounds respectively for the hosts. Four Long-Lions and five Fly Dragons players scored in double figures. Since the result was very predictable, it gave the chance for the coaches to test many bench players and allowed the starting five to rest. Long-Lions maintains seventh position with 18-13 record. Fly Dragons lost seventh consecutive game. They keep the nineteenth place with 24 games lost. Long-Lions' next round opponent will be league's second-placed Guandong Tigers in Dongguan and they do not belong to the favorites in that game. Fly Dragons will play on the road against Bayi Rockets (#20) in Ningbo and it may be a tough game between close rivals.